I promised myself that I wasn't going to let this review serve as a digression into hyperbole theater, but honestly I don't think I'm going to be able to help myself. Trick 'r Treat is the best Halloween-themed movie I have seen since John Carpenter's seminal holiday classic. With this single project, the film's writer/director Michael Dougherty has catapulted himself into my pool of names to watch. This high praise may come as a bit of a shock to casual genre fans, taking into account that many of them have probably never even heard of this film, much less seen it. 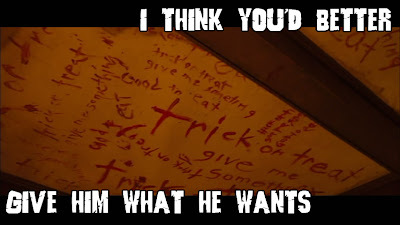 Like other recent examples, Hatchet coming foremost to mind, Trick 'r Treat was never given the wide release its content deserves. Approximately one month prior to Trick 'r Treat's slated October 5, 2007 theater release, the film's distribution company, Warner Brothers, chose to bump it from this date without providing any explanation for the delay. A theatrical release was rumored for 2008 and again for 2009, but these whispers never came to fruition and the film was instead unceremoniously dumped straight to DVD. Although official reasons for the delay have never been announced, rumors point to the involvement of Bryan Singer's production company which was involved in getting Trick 'r Treat the greenlight at Warner Brothers. When Singer's reboot of the Superman franchise failed to generate big box office, it seems as though Warner chose to give the cold shoulder to other projects that Singer had been involved with, Trick 'r' Treat being one of those targeted. It's really too bad if this story is in fact true, because Warner Brothers really missed the boat on this film. With the proper marketing I could easily see this film, like recent genre titles Zombieland and Paranormal Activity, as generating high levels of buzz within the mainstream community. For the last several Halloween seasons, I have felt as though movie companies have not been catering to the needs of the horror audience. The only real push by a movie company worth mentioning is that by Lionsgate with the Saw films, but honestly I feel as though that franchise ran out of steam about four years ago. With a name like Trick 'r Treat, a simple title that is so strongly evocative of the holiday, it seems like a seasonal release of this film would be a safe, money-making decision. The film is an anthology piece, consisting of four overlapping and interwoven stories. The film plays with the chronology of the events in a style most commonly attributed as being reminiscent of Tarantino. As an aside, I feel this comparison does the film a disservice as the filmmaker has a very firm grasp of the genre, and the film's overall feel is that of a genuine and original horror film. Trick 'r Treat does not feeling like a kitschy rehash of better films (Sorry, Quentin. For what it's worth, I once really liked Reservoir Dogs). The film earns itself a solid R-rating, featuring many themes that could not be explored in a PG-13 film. For instance, many of the characters are grade school-aged children, whose untimely and violent ends ensure that this film could not have simply been edited to play to a younger audience. The stories of the film center around one basic concept; observing and obeying the rules and traditions of the Halloween holiday. Given that the holiday has its roots in long forgotten customs and religious practices, there is a wealth of history that the movie uses to define its own internal mythology. Admittedly, many of the rules that the film throws out as tradition are ones that I have never heard of, but the way that they are presented as fact meant I never questioned their authenticity within the world of the film. This world is very similar to our own, except this is a world where ghouls and goblins do exist and all of the old legends are true. It's an interesting setting and I would like to see this universe revisited sometime down the line. The first of the four stories features the principal of the local middle school relating stories of Halloween traditions and customs to one of his misbehaved students. The second follows the events of four promiscuous college-age hotties attending a party out in the middle of the forest. The third tale sees a small group of middle-school students venture into the local rock quarry, seemingly investigating tales of a horrible bus accident that occurred there many years ago. The final story revolves around an elderly recluse being terrorized by a mysterious costumed fiend. I don't want to get into the details of the various stories because a major factor contributing to my enjoyment came from discovering the various twists and turns as they unfolded. Every time a character from one story made a cameo in another, I felt rewarded for keeping my eyes open and connecting the dots between the chronology of the unfolding events. 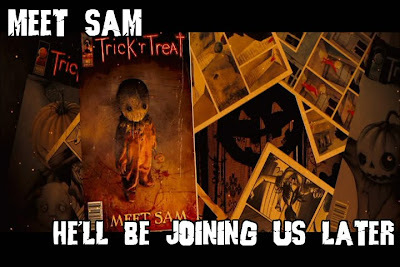 One of my favorite elements of Trick 'r Treat is the character of Sam, a child-sized entity wearing a sack-like scarecrow/pumpkin costume, whom makes appearances throughout all of the stories. There is an innocent, child-like quality to Sam that makes some of his later scenes that much more unnerving. The visual design of this character is really unique, especially in a world where grosser, nastier and more realistic villains are so commonplace. The simple sack mask that he wears is both creepy and immediately identifiable, traits that would serve him well should the world of Trick 'r Treat ever be developed into a franchise. Typically, I do not care for anthology style films because they tend to fall into very similar trappings. In most anthology films, the individual tales are strung together by a group of characters relating the stories to one another. This is a convenient contrivance that is used because the script writers do not have to spend anytime determining how the stories are related to one another. Almost always there is a "twist" at the end of the film, showing the story-telling characters as suddenly being in danger because these otherworldly, supposedly-fictional terrors are real. This is a prime example of lazy story-telling to which Trick 'r Treat, thankfully, does not fall victim. Each of the stories are well thought-out and they are interwoven into an expertly crafted tapestry of terror. The Bottomline: Trick 'r Treat is required Halloween viewing, deserving to be listed amongst the ranks of other holiday classics, like John Carpenter's Halloween. 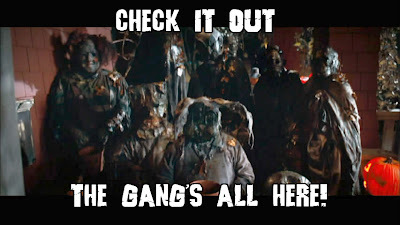 I simply cannot conceive of a true horror fan that doesn't find sheer joy in this film. Rent or buy it today! Four Bruces. Seen this film? Agree or disagree with the Geek? Let him know by leaving a comment below! Good Movie. I watched that and Sam Raimi's "Drag Me To Hell" last halloween. I love your ratings system!! Wow, Brinke Stevens showed you this film? What a night! Glad you're enjoying the site. I caught this one last night for my Halloween/OctoBoo movie month. In a word (or two)- Awesome Fun!